Dutch Design Week 2014: Design Academy Eindhoven graduate Laura Cornet has created a set of toys that allow infants to upload their own photos, videos, locations and activities to social media before they're old enough to use a computer. Laura Cornet has designed a collection of soft toys that includes a mobile, a clip, a ball and a pair of shoes. Each captures visual information or data, activated using simple gestures that can be carried out by a very young child, and automatically uploads it to a social network. Cornet came up with the idea for the New Born Fame project after her own Facebook feed became increasingly inundated with photos of her friends' babies, which she wasn't entirely comfortable with. "I thought it was weird to be involved in the life of someone, who doesn't even know that I have seen everything in his life already," said Cornet. "And the baby couldn't make a choice to maybe not show me." She began asking these friends and acquaintances about why they posted photos and reports on their kids' progress onto sites like Facebook. "At first, I talked to people whose babies were in my timeline, but later on I talked to friends of friends, who also had babies and who had spread the word on my project," Cornet said. "I also talked to a few parents who absolutely didn't put anything online, to get an idea of the other side as well." Some were very defensive about their right to post photos of their children onto social media sites. Their justifications included that their accounts were private so that only friends could see the images, that Facebook wouldn't do anything with the photos and that they believed that their friends want to see, comment and "like" the updates. "But then when I mentioned if they asked the kid for permission, a few already started questioning," explained Cornet. "All of the people replied that I was right about asking that." To stir debate about this issue, Cornet decided to put the control in the baby's hands and created a set of toys that the he or she could use to "put themselves online". 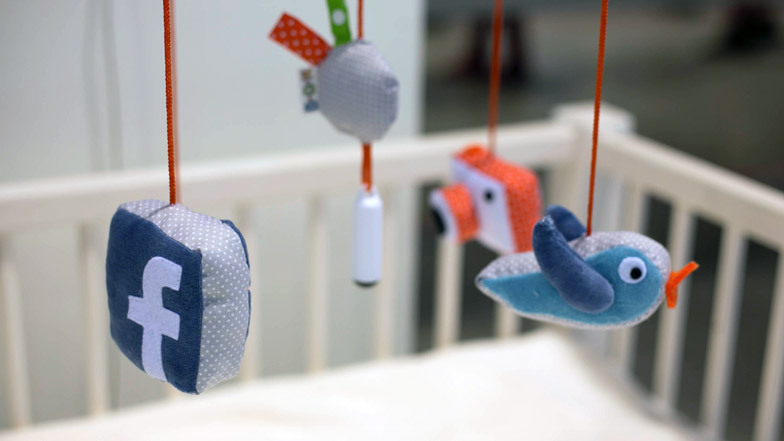 A mobile of soft hanging items, shaped like birds, a camera and a Facebook logo, incorporates a sensor-activated camera that films the baby from above. When the child reaches up, the camera records a short video then automatically uploads it to a linked-up Facebook page. A round clip that looks like a clown's face posts its location to the same online profile when squeezed, using a GPS signal. By turning a small ball, the baby takes a photograph of themselves that is also automatically uploaded with a randomly generated caption. Finally, a pair of shoes work as an activity-tracking device – monitoring the wearer's movements and sharing the captured data. "I've positioned it really as a statement to show to those parents who put everything online that the problem isn't privacy anymore, it is much broader," said Cornet. "It raises the question: 'who owns the right to put a baby on the internet like that?'. I question if the mother or father in this case actually should be the ones to decide." The tools aim to plainly demonstrate that an infant has no idea that it is providing information about itself to an audience, in the same way as when a parent does it for them. "If you show it like this, people say: 'the baby doesn't know what he's doing, it is awful that it just puts everything online'. But when a mother does the same thing, it is suddenly accepted; while the baby has no say in that." Due to the response she has received since the project was exhibited at the Design Academy Eindhoven show last week, Cornet wants to develop the toys further but remove the automatic sharing function.